We wanted to find a real problem we had that we could solve, with polish, in 24 hours. 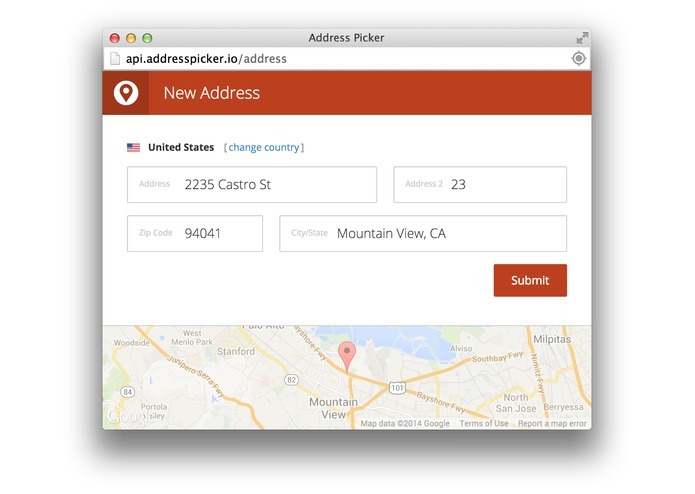 We decided to create AddressPicker.io, a simple drop-in widget for any website that will take the hassle out of addresses for everyone involved. For users, it cuts down time typing addresses significantly. The forms are as usable as humanly possible, and addresses are saved (securely!) across sites – so anytime you buy something on or sign up for a site that's using Address Picker, your addresses are a quick dropdown away. For international users, no more American-only forms! Every country has its own form on AddressPicker, with the fields relevant to the country you're adding. And for merchants: setup takes 10 seconds, and you'll have the coolest address forms on the block. Validation and correction means no more forgotten apartment numbers or misspelled street names. Handle International users with ease, or choose which countries are blocked. Hey, it's a simple problem. But next time you're grumbling at a clunky address form, send the developer to AddressPicker.io.